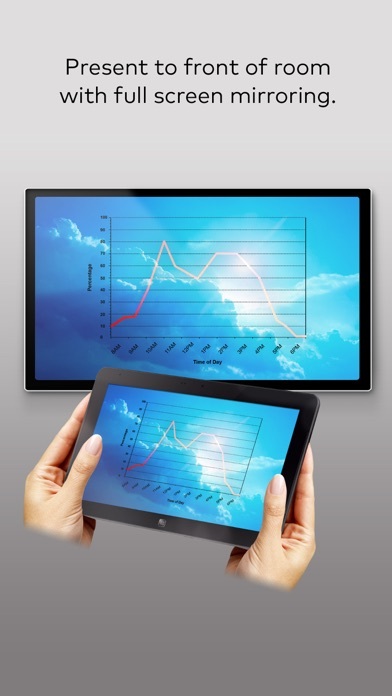 With Crestron AirMedia® you can walk into a room and wirelessly present slides, spreadsheets, documents, on-device videos and photos, even web pages and apps – all on the room display from your iPhone® or iPad®. With new full screen device mirroring, presenting directly from your favorite app is more intuitive and with better quality than ever before. 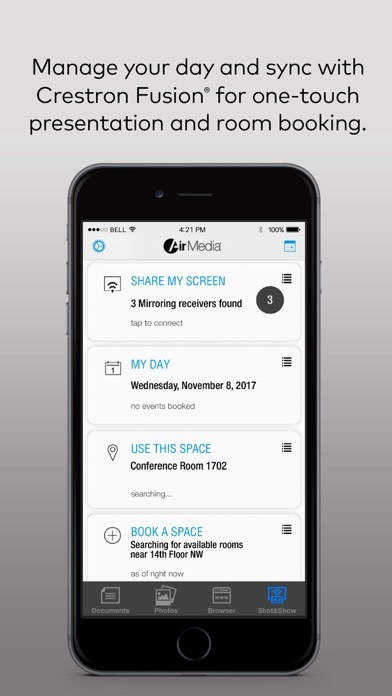 The updated interface with optional Crestron Fusion® calendaring and PinPoint™ proximity beacon support allows for the fastest full-screen connection experience available – no more being tied to a laptop or podium. 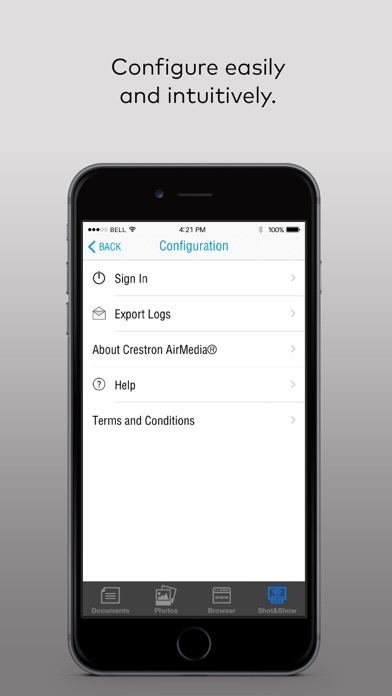 Requires a Crestron AirMedia wireless gateway (AM-101), or Crestron product with AirMedia built-in: Crestron Mercury™, DMPS3-4K-250-C, or DMPS3-4K-350-C. AM-100 users will need to install the AirMedia for AM-100 app. Wish it had support for Apple's latest phone. My university has begun using these Crestron air media receivers. However, after several months of trying to hook up my device, be it an iPhone or my Mac or a PC, I have been unable to get a single receiver to detect to my devices. The experience has been generally frustrating, to say the least. My many years of experience with CRESTRON has become a shared laughing stock among my fellow CRESTRON unfortunates. My company just installed a brand new system with many thousands of dollars of superfluous add-on’s. I am the geeky-est of our group and find the vexing latency of the app interface only delays the disappointment with its primitive capabilities : totally 1986-era ( CRESTON AGAIN!) It reminds me of the restaurant review: “not only is the food bad, but the portions are small” How does CRESTRON get away with this???? 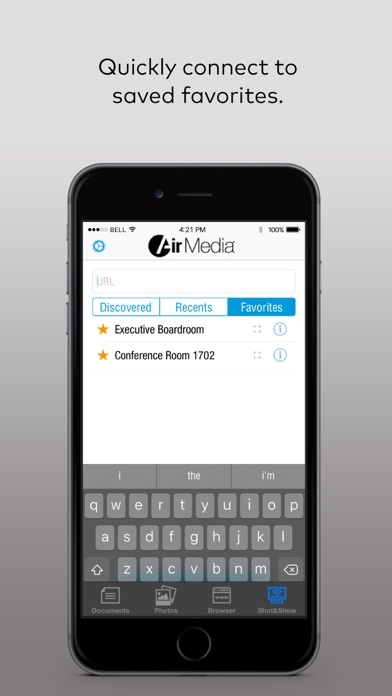 As a business A/V provider this app is woefully under developed. The app just opens to a black screen and does nothing. When I double tap the home screen the preview shows me the main menu, but when I tap back into the app it goes black again. It barely works. Locks up and crashes constantly. Poor UI. Aspect ratio often wrong. Compatibility issues. Slow. Wish my org didn't use this. Can't show what is on my screen. Only a limited number of files formats. A huge step back in terms of functionality compared to a simple projector. Had the previous version of the app working on my iphone. Downloaded this app for my ipad (iOS 10.3.3). Connected to same wireless network as rest of the enterprise. Doesn't find anything to connect to. Restarted iPad and app multiple times. 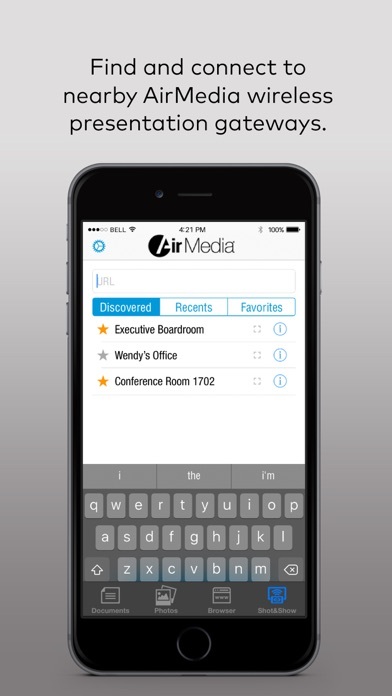 The AirMedia desktop app is fine...but this app is 'no bueno'. More by Crestron Electronics, Inc.